We have had a few complaints about dagger boards not fitting in their trunks, but we knew that we had designed in plenty of tolerance, right? We figured that it was sloppy epoxy work or wear strips that weren’t glued down tight. 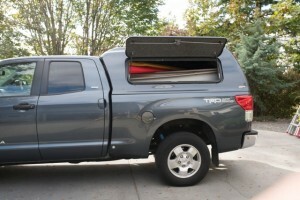 Imagine our surprise when the board didn’t fit into the trunk in our new boat! What is causing this? Well, to start with, the board is binding at the fore & aft edges, where we thought we had enough clearance. Are the new boards longer in the fore & aft dimension? It doesn’t appear so. Please see this printable PDF for the fix. The solution to this problem for existing builders will vary depending on whether the trunk and foils have been built already, or one but not the other have been built. We apologize for difficulties caused by our screw-up. We will ship out replacement trunk logs for anyone that hasn’t built the trunk yet and we will trim a bit from the aft edge (and re-round) any dagger boards shipped for existing boats. Please keep in touch if you have any similar issues. We could have found and corrected this much sooner had we known that it was a fore & aft clearance issue. We care about this stuff a lot, so if you find a real issue, let us know. The new PT 11 manuals are ready. Who needs one? A very short update about gluing the bumper: We now advise not to use Tolulene to prep your bumper for gluing. It appears to be totally unnecessary. Just sand thoroughly and wipe clean before gluing as described in the manual. ...when one feels the need to alter course. Russell and I started PT Watercraft in 2009, to create an outlet to share Russell’s vision for a really good nesting dinghy. Since then, he has built 8 boats to define the build process, take the right photos and to update the manuals. 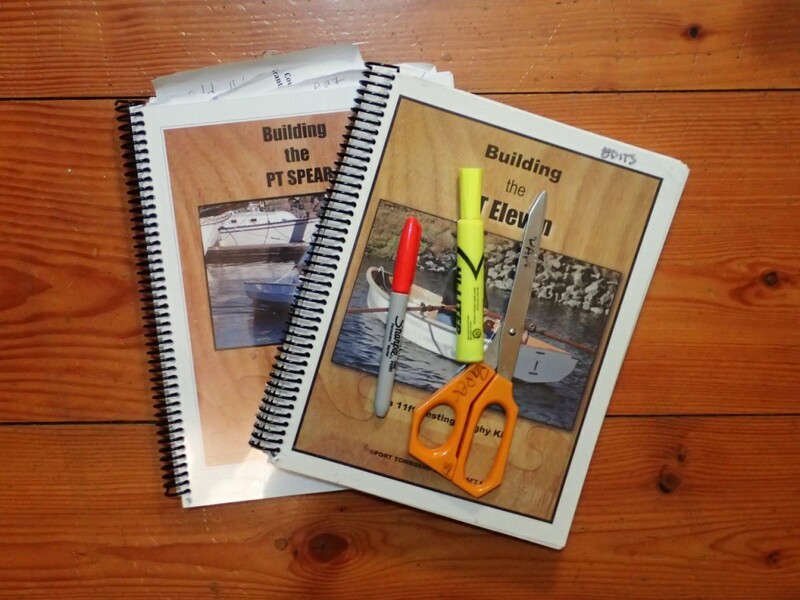 A major revision of the PT11 and Spear manuals has only just been completed. 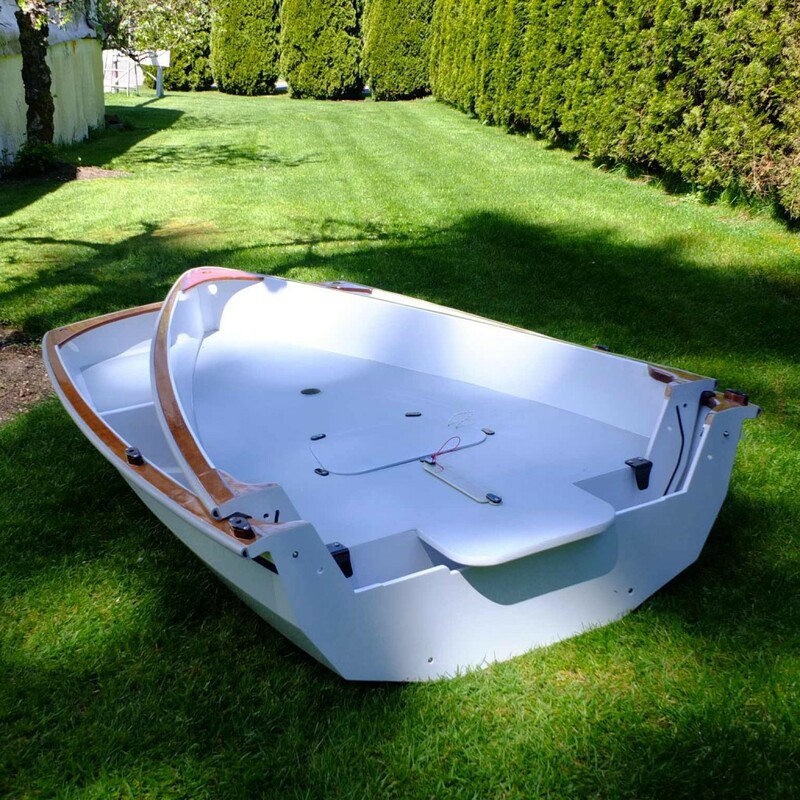 He has also built parts for approximately 175 kits, including 130 for the PT 11 nesting dinghy. By Intention, our business model has been a small and custom operation. We are more creative in nature than business minded, so expanding to include employees and larger production has not attracted us. Instead, we have farmed out many aspects of our production to the abundant local talent found in Port Townsend. The level of detail and care put into each kit has earned us a reputation that we are proud of: that our kits take the kit concept to a higher level than others, at a price, but at excellent value for the money. Unfortunately, this is also a business model that is difficult to sell. Yes, when we started, we thought we’d create the business and eventually sell it. What we find is that with open ended shipping dates, we never seem to get ahead of stocking parts and getting kits out the door. There are no gaps between for writing books that we have promised our book customers, nor to develop new ideas. By re-organizing our shipping schedules, we hope to reserve time for these creative endeavors. This might mean fewer kits produced but our level of quality and service would remain high. What are the actual changes at PT Watercraft? We have had to raise our prices. This was a really hard decision for us. In an effort to keep our prices in some sort of league with similar sized boats, we have never paid ourselves very well for the labor intensive product we produce and materials and shipping costs just keep going up. On the other hand, we are not willing to ship a lesser quality product. Because most of our kits are sold in Fall and Spring, we are considering to restrict shipments to specific time frames within those seasons. Deposits accumulated in Summer and Winter will largely dictate the number of kits we ship. We are suspending all exports. Exporting has always cost us more with extra paperwork and materials (heavy duty crates, for example). Customers abroad pay increasingly more for shipping and import duties. It just does not feel right and we sincerely apologize to those outside of the US who were hoping to get a PT 11 kit. Canadians can make a road trip of it or we can ship to bonded shippers on our side of the border. Our customers are really important to us. We are here for you and will continue to work through this transition. We are dedicated to good service and creating the nicest kits we possibly can. Please follow our blog as we trial new arrangements. Our home page now has a clear explanation of what makes our kits special. Further details are continued on the PT 11 homepage. The website may appear a bit haphazard for a while. I am shuffling things around and trying to simplify it all. 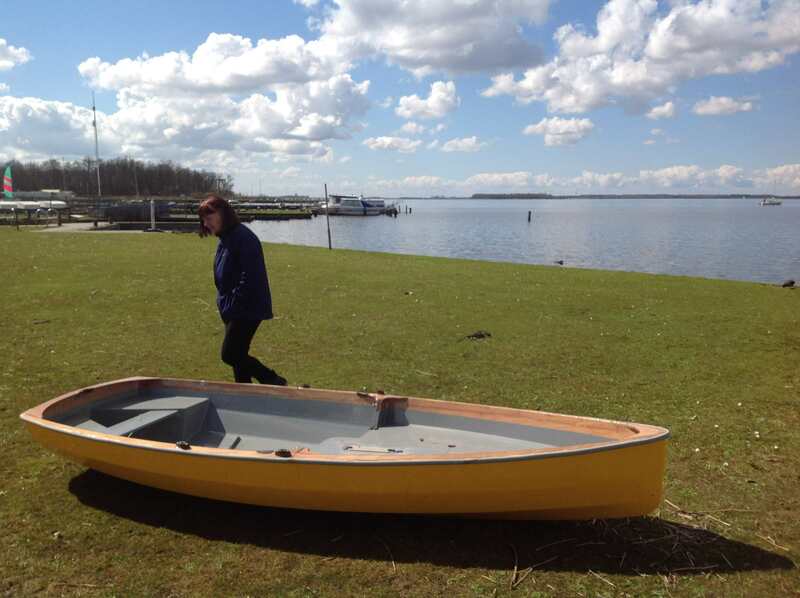 There are many nesting dinghy kits available, but our PT 11 dinghy kit is a bit different. Because our kits are quite expensive, we would like to offer some explanation. We would also like to make sure that our kit’s are an appropriate choice for anyone thinking of building one. We are long-time designers and builders of high-performance sail boats. Nesting dinghies have been a passion for more than 40 years, during which time our study of the compromises and possibilities have been a bit of an obsession. Many prototypes have led to the kits that we now offer. Could we have created a simpler and more affordable boat? Of course we could have, but it wouldn’t have the qualities that make the PT 11 such a great boat. What features make this boat special? The ability to assemble and disassemble the boat in seconds, in the water or out of the water. 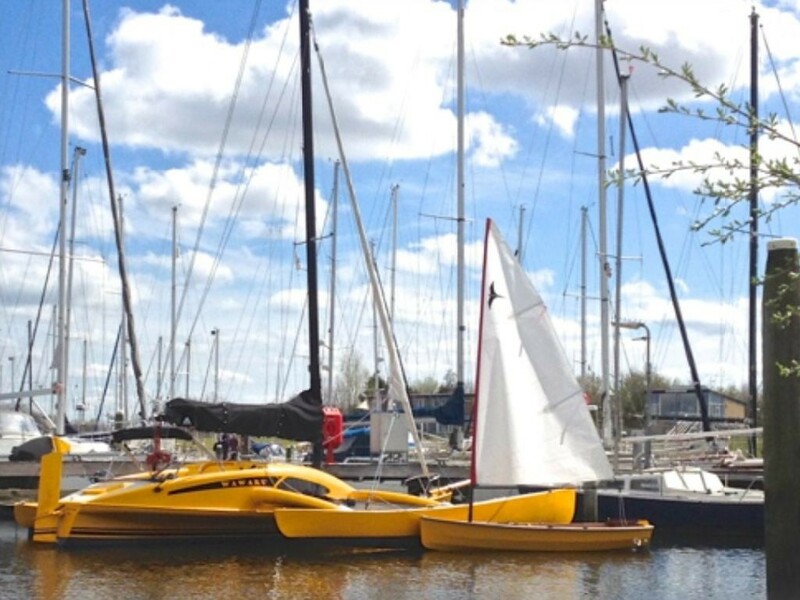 The unmatched strength of the assembled boat, a challenge in nesting dinghy design. The rowing performance of our boats is quite amazing. One was used in a 70 mile endurance race last year, finishing in the top third of a 120 boat fleet in under 20 hours, surprising for an 11 foot dinghy. An outboard motor is quite unnecessary when using the boat as a tender. The sailing performance is very good. The stock foils (machined daggerboard and kick-up rudder) help the boat sail upwind like a 12 meter. The rig is the lightest and easiest to use dinghy rig on the market. 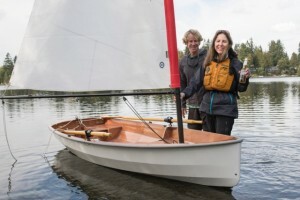 The two-piece carbon mast and boom, sail, and all rigging weigh just 10 1/2 pounds, store in a small bag, and assembles in minutes, making a quick sail in a new anchorage easily done. Other prominent features include a large truly watertight storage area, sealed flotation tanks fore & aft, and a very dependable daggerboard trunk cap that allows towing in rough water and at high speeds. Two rowing stations and multiple foot brace positions allow keeping level trim with multiple passengers and allow rowers of different heights. These qualities are combined with many other well-thought-out features, some that make construction easier and many that make the boat easier to use, lighter, and more efficient. What do we not like about the PT 11? It’s complex. While we have not over-engineered this boat and we continually work on making the build simpler, a really good nesting dinghy, especially one that could last forever, requires complexity. Much of that complexity is on our end. We manufacture many custom parts for the boat and we aren’t shy about expensive alternatives. The fact that we have sold so many kits for the PT 11 with almost no advertising says a lot. Builders of the 11 see the value of the kit, the manual, and the finished product. Resale values of well built PT 11’s also point to a well conceived product. Is the PT 11 for you? If you are attracted to the boat and it fits your needs, then maybe. Are you right for the PT11? Probably, if the next sentences work for you. If you want the performance that our kits offer and aren’t afraid to put in the effort and time required, if you look forward to a good winter or summer project, and are willing to carefully follow a very detailed building manual. Building a boat can be a very satisfying and rewarding experience; an experience that is increasingly missing in modern times. We ask a lot of our builders, but they get a lot in return. They get the experience, a new set of skills, and in the end, they get a very versatile boat. We hand pick through units of high grade Okoume plywood to find the best looking and flattest panels of five different thicknesses of plywood. This doesn’t mean it’s always perfect, but we choose the best available and it’s a wonderful material for this type of boat. Most of the plywood parts are CNC machined, but many of them are post-machined to bevel and round edges where appropriate. The lumber parts kit (foredeck stringers, glue cleats and reinforcements) are machined from high-grade Sitka Spruce. 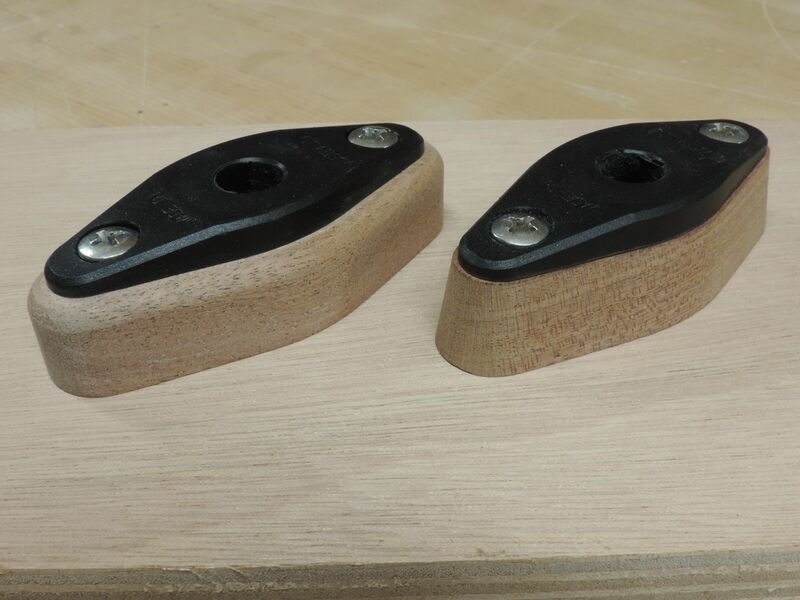 The foot braces, oarlock riser blocks, and back seat cleats are machined to a ready-to-finish level from Sapele mahogany. We supply the best glass cloth of 3 different weights to protect and reinforce, while keeping the boat as light as possible. Carbon fiber alignment clips, goose-neck fittings and fiberglass mast sockets are molded “in house”. The foils are CNC machined from carefully selected Okoume plywood (2 layers of 12 mm Vacuum bagged together on a “flat table”) to make NACA section foils of almost 1” thick. For the weight and performance offered by these foils, they are relatively very affordable and not difficult to finish. The machined 316 stainless connective hardware is machined by Paul Zeusche, an expert local machinist and boat builder. This hardware constitutes a large part of the value of the kit and is continually fine-tuned. We are extremely lucky to have some very smart friends. Many other parts and pieces are produced in our shop or locally. Besides the plywood, which is made in France, just about everything in one of our kits is made in the US. The most valuable single piece of the kit is the building manual. 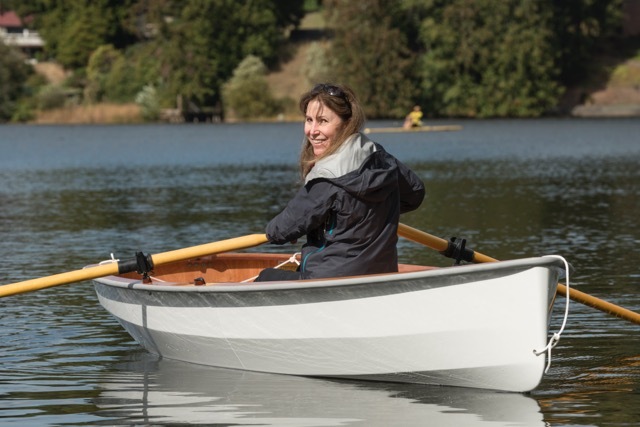 We don’t encourage people without hand tool experience to build our boats, but the manual allows someone with no epoxy or boat building experience to build a really good boat. We are now completing our 8th PT 11, built to improve the manual and fine-tune the kits (as were the other 7). We do this so that our builders can get the most value, pleasure, and longevity from their boats. The kits and manuals for the PT 11 and PT Spear are getting better every year. 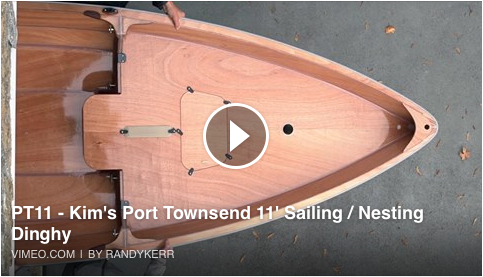 We have also been working on a video series with Off Center Harbor, showing the more technical parts of building a PT 11. These video’s will be available free to our builders. We hope builder will follow the blog for important updates. We recently had the opportunity to document painting a PT SPEAR. I put together a video of applying the first coat and some highlights of the third coat. The video is not a “how-to” but rather a demonstration that may be most useful to those of you preparing to paint your own home built boat with Interlux Perfection 2-part LP paint. The book, Rolling Perfection, really shows the technique Russell uses, from mixing, thinning, and applying onto a variety of surfaces, including non skid. You might note that we do not use a primer. 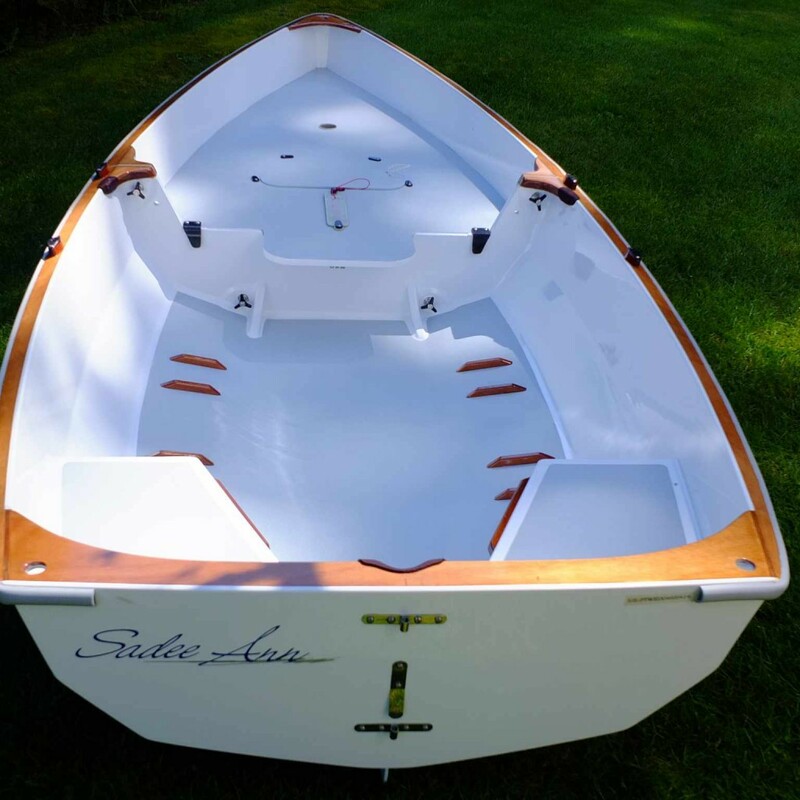 Our boats are built using WEST SYSTEM resin and 207 Special Clear Hardener; saturation, fill, and gloss coats. This prepared surface has been perfectly suitable as a base for applying this paint (and its Interlux predecessors) on Russell’s boats over the last 30 years. The PT 11 and Spear are very dependent on gaskets. The 11 has a hull gasket, a hatch gasket, and a trunk cap gasket. The Spear has two hatch gaskets and a trunk cap gasket. One of the issues is that gluing the latex gaskets is difficult, so they can come loose. 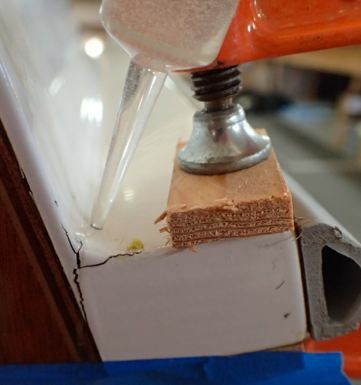 We have tried just about every adhesive and have finally found one that works much better than the contact cement method described in the manual. More about that in a soon-to-come blog post. The other thing we have recently had happen is the outer face of the gaskets becoming stuck to their mating surfaces. This seems to be a problem mostly with the trunk cap, where the gasket is pressed much more firmly, due to the gasket notch depth being limited. We tried coating the outer face of the gasket with a few different lubricants, Vaseline being the one that seemed to work. We will do a blog post about gluing in new gaskets with the adhesive we have found to work, but first we would like feedback on gasket issues from our customers. -What issues have you had? -Do you need a new set of gaskets for you boat? -If your gaskets are working fine, consider rubbing a light coat of Vaseline (or maybe you know of something that will work better) on the outer face of the gaskets, especially if your boat is being left assembled for long periods of time. 2017 Plywood, kits & a special offer! The new batch of plywood is BEAUTIFUL and kits are rolling off the CNC machine. Out of this batch of PT11 ans PT Spear kits, everything is beautiful, except....one PT11 foredeck. As it is not cost efficient to cut just one new foredeck, we are offering this kit with a $50 discount. See the photo below to better understand this somewhat deep but pretty small flaw. (smaller that a quarter) Anyone want to try their hand at an inlay repair? flaw located on the foredeck neat the mast step. 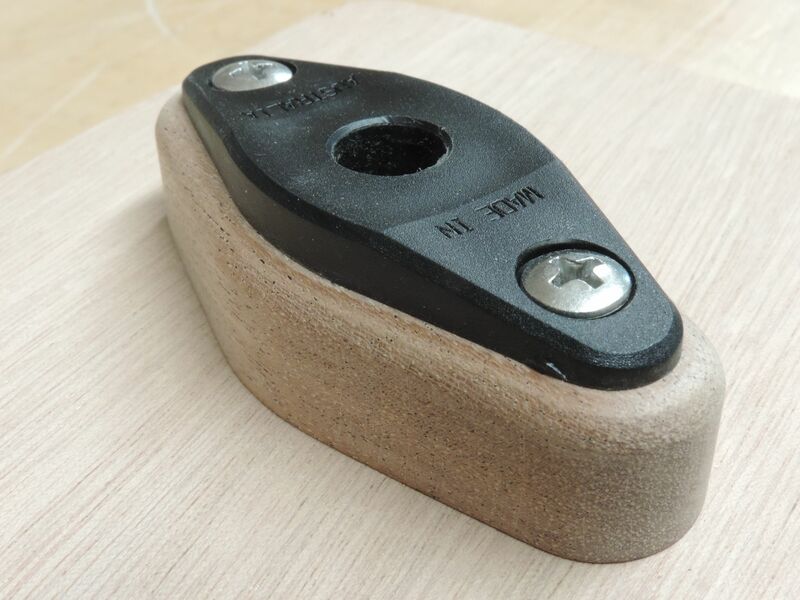 Our mahogany riser blocks of the past were beautiful complex shapes that performed a nicely functional duty; to give the oarlock socket more bearing and to offset the height of the seat relative to the height of the oarlocks. They were, however, rather beastly to make in the quantities we have been needing. To improve production, Russell took the design to Turnpoint Design and figured out how, with minor changes, they could be machined on the CNC router. The remaining labor, (sanding out the tooling marks and rounding the upper edges ) is a great deal less time consuming than the previous version. Comparison photo, new style left, previous version-right. It’s time for us to admit it, our boats seem have a weakness. We may just be treating our boats poorly, but it’s more likely that there is an issue that PT 11 owners should be aware of. Owners, please check your gunwales for cracks. Builders, there will soon be an added step in the building manual to prevent the problem. If you haven't glued your bumper on yet, the fix is easy. This printable PDF informs for both a fix or the added step in the build process. We have seen this failure three times now. The first, when one of our boats got driven over (just the edge) by a truck. We thought that was unusual punishment, fixed the boat and forgot about it. The second time was a boat that got beat up by solid water while lashed to a foredeck. We didn’t really know what happened there. When the boat is upside down in the nested position and somebody walks on it (or a bunch of people sit on it), where does that weight go? It goes onto the very ends of the gunwales on the fwd hull half. photo shows where the load goes, (the aft corners of the forward half). The failures we have seen have always been in the plywood hull skin (right where you would expect it). Fixing the break and the weakness that caused the break are both pretty easy and important. 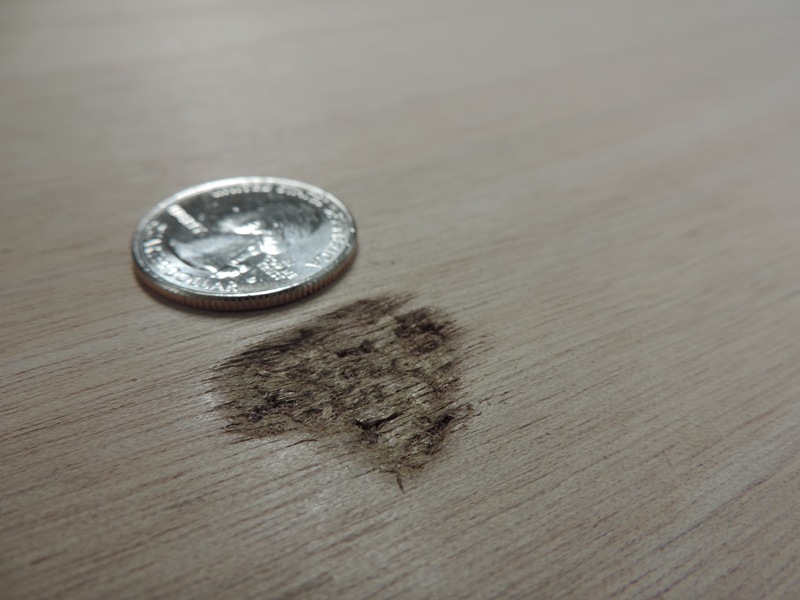 The first is done by injecting epoxy into a carefully drilled hole to fix the crack, the second by putting screws (with epoxy) into carefully drilled holes. Please click here to see the printable PDF with full instructions with photos. I admire those who take on the challenge of building a boat or an airplane. CNC technology on kits has done for creative people, what the GPS did for adventurous people. (Not that they might not be one and the same) Cruising is far more accessible to those without traditional navigational skills, and CNC routering has opened up a whole new avenue to those who want to create something that would otherwise have been beyond their skill level. Pause on that thought while mentally revisiting a lot of fun sailing..... OK-back to the present. Our customers come from many walks of life and a wide range of ages and skill levels. However; they never fail to impress me. While Russell can take credit for creating a beautiful design, kit and manual, our customers need the vision, passion, patience, and attention to detail for good results. To add the complexity of documenting their own efforts takes the same qualities and much more. I cannot, for example, count how many tens of thousands of photos Russell had to carefully set up, snap, choose, and edit to get a few hundred for the manual. and creative little video. The feedback from Kim and her family has been so meaningful to us and I feel puffed up with pride like a mother hen. With their permission I am sharing some of that feedback and the wonderful present of this video. Randy's videos are all beautifully created and fun to watch so explore and let them know what you think. 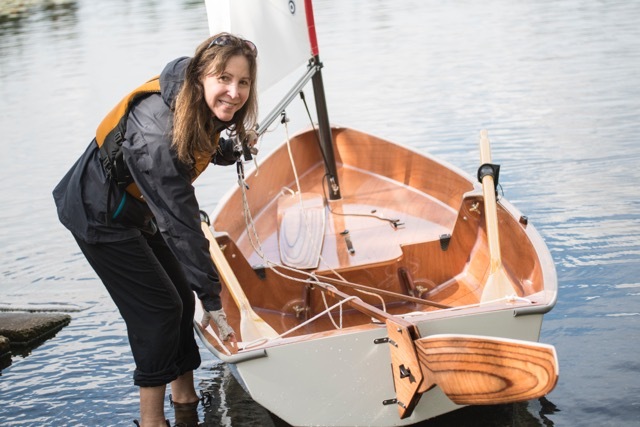 From Kim, "It was your PT11 kit that made my dream of having a sailboat come true!!!!! Randy and I can’t quit talking about how grateful we are that you guys put so much heart and thought into such a beautiful and smart kit. She sails and rows like a dream! Highlight of our summer to build and sail that boat! So thankful for you and Russell."